Six independent arms can carry towels, suits, or clothes on hangers. Provides the equivalent of 18’ of line space. Six independent arms can carry towels, suits, or clothes on hangers. Supports 10 lbs per arm, 60 lbs maximum load when evenly spaced. Attaches to ladder in less than a minute. Chrome plated arms and a plastic body resist rust. 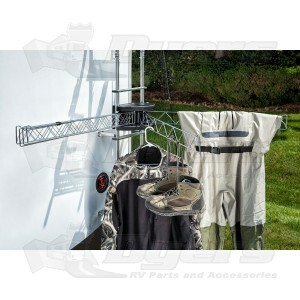 Wall mounted bracket provided for home use, or RVs without ladders. Actual wire arms are 42” long.